If you are like me, you are gleefully anticipating beach season! Dipping your toes in water, settling into a beach chair to read a book under the glorious sun, having a picnic overlooking crystal waters stretching over the horizon, playing frisbee with a beautiful backdrop, exploring a natural wonder with kids--so many things to enjoy during a day at the beach! While it may seem easy to resign ourselves to believe worthwhile beaches only exist on the coasts, the Midwest has some rather enjoyable beaches! With the help of some of my favorite Midwest travel writers, I have put together a list of some Midwestern beaches to help you plan your summer getaway! Gillson Beach, Wilmette: Gillson Beach has long been one of my favorite beaches along Lake Michigan. The view is marvelous, the beach always seems to be clean and there is a nice playground that kids can enjoy without leaving the beach area. Surf's up at Indiana Dunes! Image courtesy of Rachael of Nothing if Not Intentional. Indiana Dunes: The Indiana Dunes are a national treasure earning the designation of a U.S. National Lakeshore. 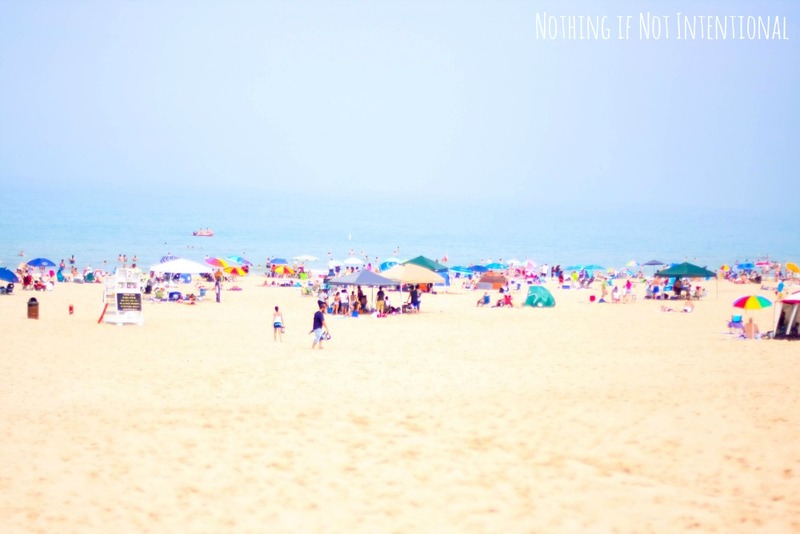 Rachael from Nothing if Not Intentional shares an escape to the Indiana Dunes. You can easily make a day of it with beach time, a visit to Taltree Arboretum and Gardens and the state park's nature center. Need food recs? She has ideas too! A secluded swimming hole at Ludington State Park. Image courtesy of Francesca from The Working Mom's Travels. Duck Lake State Park: Melody from Grand Rapids Kids suggests Duck Lake State Park for a hidden gem beach adventure. 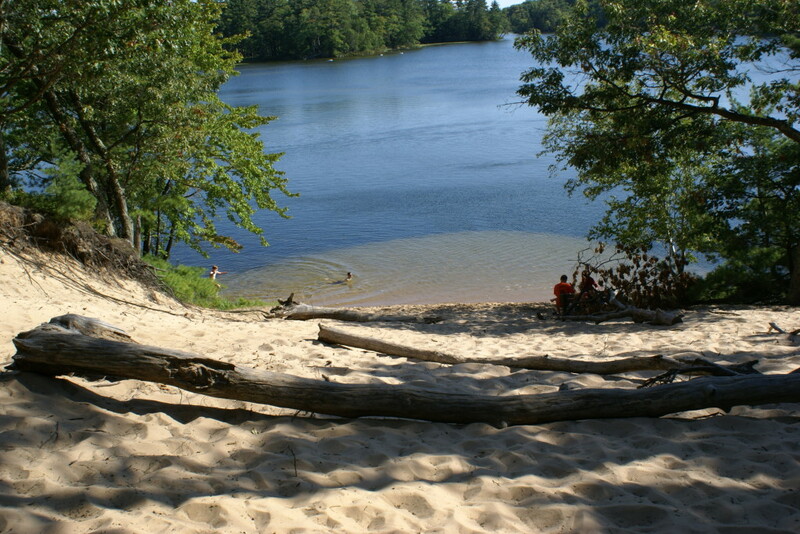 Duck Lake is an ideal location with pleasant beaches yet calmer waters than those found on Lake Michigan. Dunes provide spectacular views while scaling them is manageable by those with little ones in tow. Grand Haven: Grand Haven Beach offered a slice of heaven during our summer vacation last year. Beautiful beach alive with summer fun in close proximity to a quaint downtown worthy of exploration. Walking along the pier to view the town's lighthouses invited splendid memories. Lake Michigan Beach Park: Lake Michigan Beach Park is located in Empire which Midwest Guest informs us is the home of one of the world's quirkiest festivals, Asparagus Festival. Of course, the beach is the perfect spot for summertime fun including swimming and kite flying. Nearby South Bar Lake tends to be warmer and also a nice spot to swim. Ludington State Park: Francesca of The Working Mom's Travels savored a camping adventure at Ludington State Park. 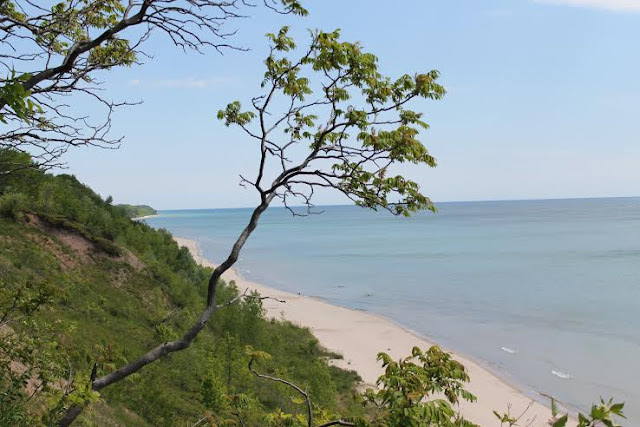 Stunning views from the campsite, a sweeping view of Lake Michigan from the beach and a host of water activities and hiking opportunities provide families with a much needed escape. Oval Beach: Selected as one of the world's 25 best beaches by Conde Naste, Oval Beach features a gorgeous vista. Jessie from Wandering Educators suggests climbing nearby Mt. Baldy and then crossing the dunes before a pleasant cool-down at the beach. Rosy Mound Natural Area: Located in Grand Haven, Rosy Mound provides a quieter alternative to Grand Haven Beach. Love hiking? To explore the beach, you do need to mount stairs to climb over the dunes. Marvelous wooded area, amazing views from the top and a relatively secluded beach--we found it to be a wonderful escape. South Haven: In South Haven, Dang Travelers discovered not only a place to crush sand between your toes but a charming small town as well as a 34-mile trail worthy of some meandering. Beaching it at Branched Oak in Nebraska! Image courtesy of Kim at Oh My! Omaha. Branched Oak: Beaches? In Nebraska? Kim from Oh My! Omaha discovered Branch Oak Lake not too far from Omaha. The recreational area features a large lake with a sandy beach (as in the type that is conducive to make sandcastles), campgrounds, pontoon, paddleboat and canoe rentals and fishing. Lake McConnaughy: Gretchen from Odyssey Through Nebraska uncovered another beautiful lake in Nebraska--Lake McConnaughy. 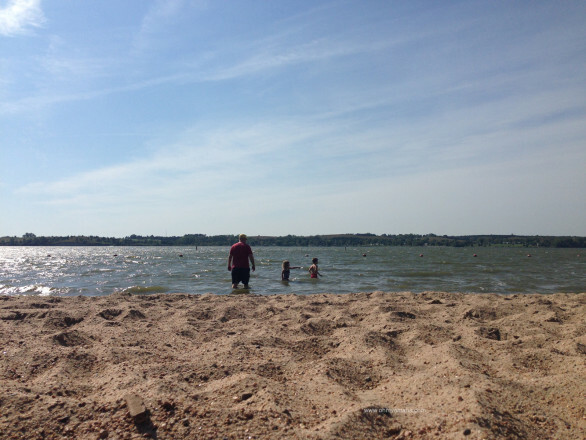 Lake McConnaughy offers campgrounds and a range of aquatic activities. Views are stunning but during her visit, Gretchen found the lake a little buggy, so be prepared! Headlands Beach State Park: Tonya from The Traveling Praters takes us to Headlands Beach State Park which is rated as one of the best beaches on Lake Erie. The stunning beach is a mile long and features two historic lighthouses, one housing a maritime museum and one that is be renovated into a vacation retreat. The majestic bluffs of Port Washington. Image courtesy of Julie Henning from Roadtrips for Families. North Beach, Racine: North Beach is one of our go-to beaches for a spur of the moment trip. Parking and admittance are free, there is a nice pier for a walk and the views of the lake are gorgeous. For kids, there is an enormous park nearby. Certain weekends in the summer, you can also climb the Wind Point Lighthouse. Port Washington: Julie from Roadtrips for Families suggests Port Washington where picturesque bluffs afford amazing views of Lake Michigan and the town of Port Washington itself. Williams Bay Beach: Instead of settling down on the main beach in Lake Geneva, we like to drive a little further to the calmer Williams Bay. There is a nice park near the beach and the town is within walking distance. Kids enjoy jumping off of a pier. 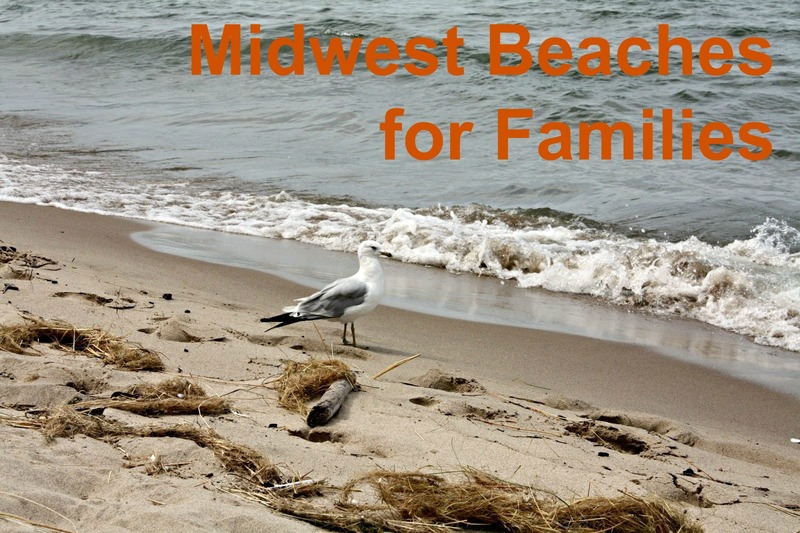 Do you have a favorite Midwest beach? Please share below! Great round up! I grew up in West Michigan and can attest to many of the great beaches you mentioned! Another one we love is Van Buren State Park, just south of South Haven. It's a bit rocky but has great restrooms and an easily assessable walking path. It also tends to be a little less crowded.